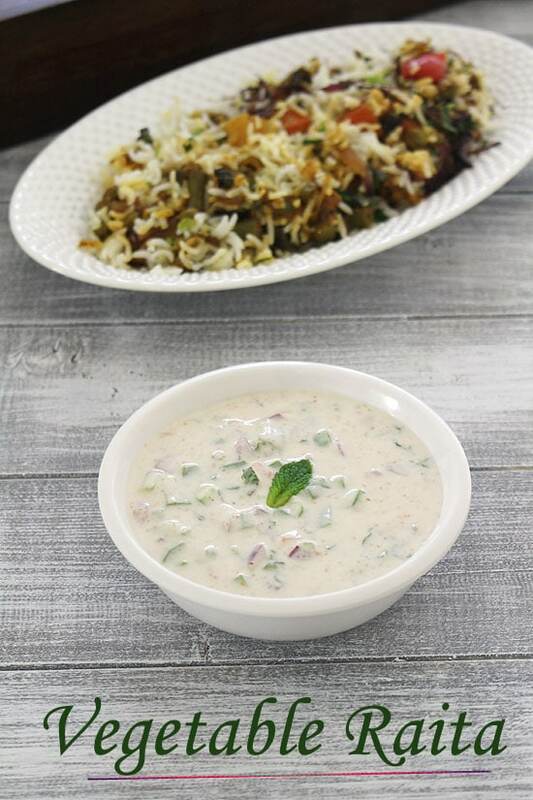 Vegetable raita recipe – chopped veggies are mixed with chilled yogurt and few raita spices. Best served on side with rice dish, pulao or biryani. People usually prefer to make raita during the hot weather or summer season. Since it is made from yogurt and it has cooling properties. But at home we make it all year around. Hence sharing the recipe here too. I made this vegetable raita few days back. That time it reminded me that I have this post lying my draft and never posted here. So here I am clicking on publish button today. This mixed veg raita is simple, easy and quick to make. Chop up the veggies and mix everything with yogurt. And it is ready. The choice of vegetables are up to you. You can skip any if you do not like. Or any other like grated carrot, beetroot, fried potato etc. Always serve the raita chilled. So start with chilled yogurt right from the refrigerator. 1) Take chilled yogurt in a bowl. 2) Whisk it well till it gets smooth. 3) Now add roasted cumin powder, black salt, black pepper powder, red chili powder and salt. 5) Add chopped onion, tomato, cucumber, capsicum, coriander, mint leaves and green chili. 6) Stir well to combine. Remove it to a serving bowl, garnish with mint leaves and serve. Since there are raw onions in it, It is best to serve right away or within an hour. 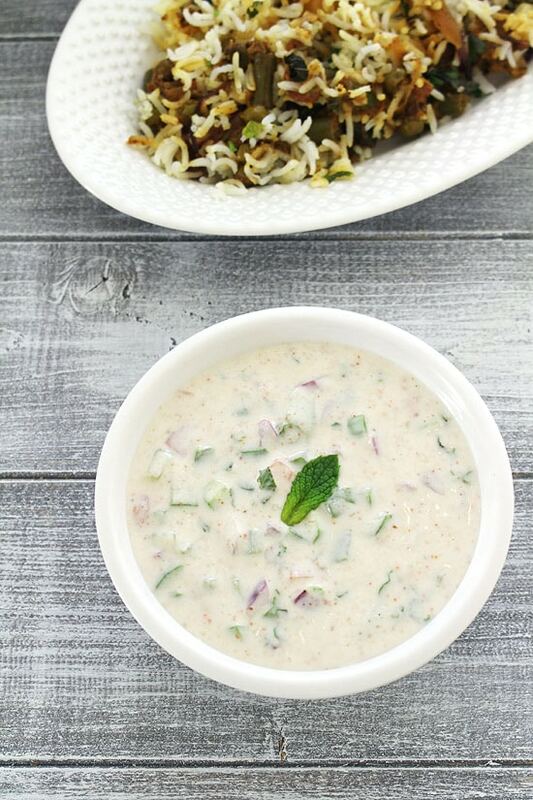 Serving suggestion: Serve mixed vegetable raita with any pulao or biryani. Here I have served with veg dum biryani. Take chilled yogurt in a bowl and whisk till it gets smooth. Add chopped vegetables, green chili and coriander, mint leaves. Stir well to combine. Remove it to a serving bowl, garnish with mint leaves.